The hydrogen is coming from hydrothermal vents at the bottom of Enceladus’s subsurface ocean, scientists said, similar to geologic features found deep underwater on Earth. “This is a very significant finding because the hydrogen could be a potential source of chemical energy for any microbes that might in be in Enceladus’s ocean,” said Linda Spilker, project scientist on the Cassini mission at NASA’s Jet Propulsion Laboratory in Pasadena, California. Cassini measured the hydrogen during a high-speed pass through jets of ice and dust spewing from Enceladus’s south pole in October 2015, the deepest dive through the plumes since the spacecraft found them them in 2005. The fountains erupt through fractures, dubbed tiger stripes, visible in the moon’s icy crust. While Cassini does not have the instrumentation to directly confirm the presence of microbes in the ocean of Enceladus, the latest data from the space probe reinforces the notion that the icy moon of Saturn — one-seventh the size of Earth’s moon — is one of the best places to look for extraterrestrial life in the solar system. Researchers also presented new evidence that Jupiter’s moon Europa — more than six times bigger than Enceladus — could have periodic eruptions similar to ones coming from Saturn’s moon. William Sparks, an astronomer who analyzed imagery from the Hubble Space Telescope, said his research team has linked the location of a likely plume found by Hubble with thermal maps from NASA’s Galileo spacecraft, which orbited Jupiter and made repeated flybys of Europa in the late 1990s and early 2000s. It turns out the plume near Europa’s equator is at the same location of a hotspot identified by Galileo, said Sparks, who works at the Space Telescope Science Institute in Baltimore, Maryland. 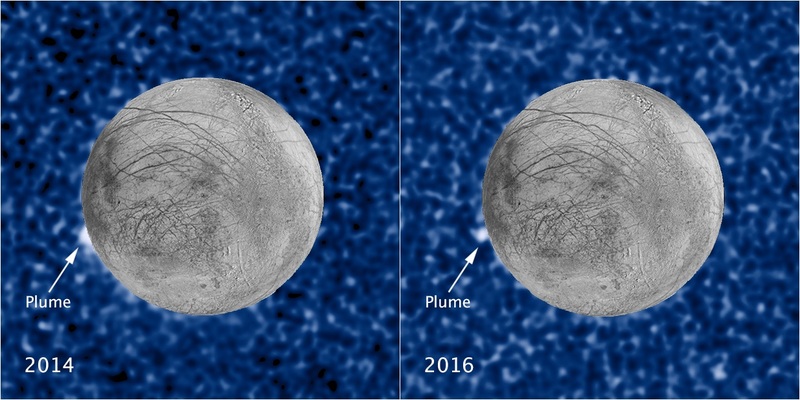 The latest Hubble imagery builds on previous observations in 2012 and 2014 that suggested Europa might have intermittent plumes streaming as high as 60 miles — 100 kilometers — above its surface. “In 2014, we used the Hubble (telescope) and detected evidence of what are probably water vapor plumes emerging form the surface of Europa,” Sparks said. “That’s important because it could be giving us access to subsurface liquid water without having to drill through miles of ice. The strong tug of gravity from Jupiter and Saturn is responsible for the churning and heating inside Europa and Enceladus that maintain their liquid water oceans. 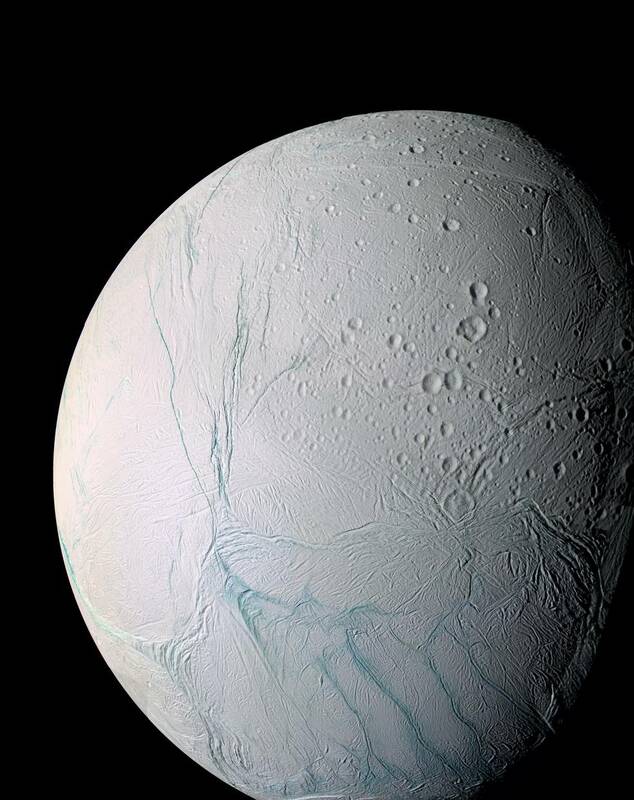 With the discovery from Cassini announced Wednesday, scientists know Enceladus has the water and chemicals needed to support life, according to Mary Voytek, a senior scientist in astrobiology at NASA Headquarters in Washington. “Certainly, this finding suggests that there is a significant amount of hydrothermal activity to produce such a strong signal of hydrogen, and this hydrogen is a good source of chemical energy to support life,” Voytek said. Cassini’s ion and neutral mass spectrometer identified molecular hydrogen as Cassini zipped through the plumes at around 19,000 mph (8.5 kilometers per second). Researchers were eager to make the hydrogen detection, knowing such a finding would bolster the chances that life may lurk hidden beneath Enceladus’s icy shell. Waite is lead author of a paper in the journal Science outlining the hydrogen discovery. 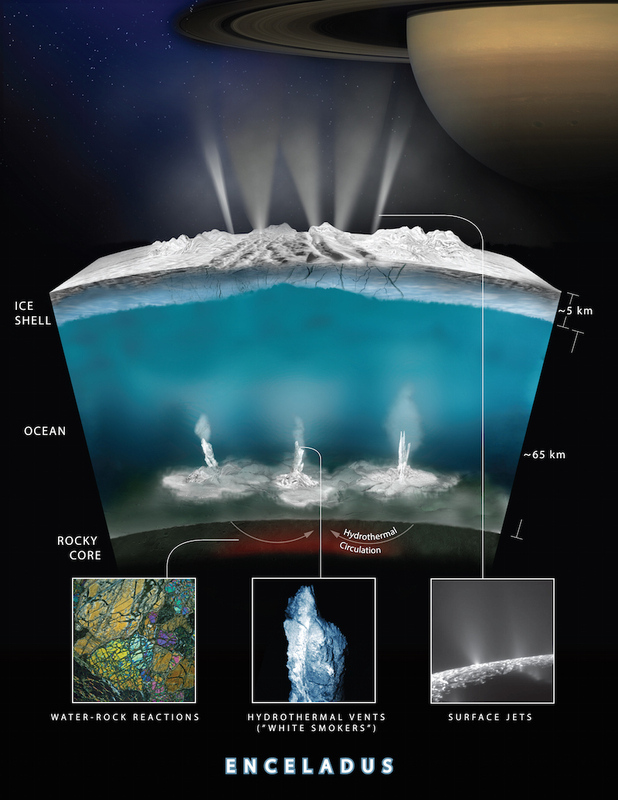 This graphic illustrates how Cassini scientists think water interacts with rock at the bottom of the ocean of Saturn’s icy moon Enceladus, producing hydrogen gas. The hydrogen is made in a chemical reaction between warm water, carbon dioxide and rock at Enceladus’s seafloor, a geochemical process called serpentinization found in hydrothermal vents at the bottoms of Earth’s oceans. Like the vents in terrestrial oceans, hydrothermal environments on Enceladus — a billion miles farther from the sun than Earth — are starved of sunlight, and any life forms that took hold there would have evolved to seek an alternative source of energy, like hydrogen. Scientists calculated the energy available to potential alien microbes living in Enceladus as roughly equivalent to 300 pizzas per hour, according to Glein. Conceived in the 1980s and built in the 1990s, the Cassini spacecraft was not designed to search for life at Enceladus. The mass spectrometer that made the hydrogen detection at Enceladus was originally intended to sample the atmosphere of Titan, Saturn’s largest moon, but managers repurposed the instrument to examine the icy moon’s polar plumes after Cassini discovered the geysers streaming into space in 2005, soon after the probe arrived in orbit around the ringed planet. “This finding is the result of 12 years of Cassini investigations, and it really represents a capstone finding of the mission because we now know that Enceladus has almost all of the ingredients that you would need to support life as we know it on Earth,” Spilker said. Cassini is in the final year of its mission, heading for a plunge into Saturn’s atmosphere Sept. 15 after a series of passages between the planet’s cloud tops and rings set to begin later this month. The plutonium-powered spacecraft will not fly by Enceladus again, and a final swing by Titan on April 22 will use the moon’s gravity to reshape Cassini’s orbit to fly inside Saturn’s rings. Launched in 1997, Cassini is running low on fuel, and officials want to ensure it does not crash into moons like Enceladus that could harbor life. NASA decided in 2010 to steer Cassini into Saturn, destroying the spacecraft to avoid plowing into the habitable moons while capturing unprecedented data on the planet’s rings and atmosphere. NASA has no more missions to Saturn on the books, but scientists are finalizing proposals for new interplanetary robotic probes to be submitted to the space agency by April 28. 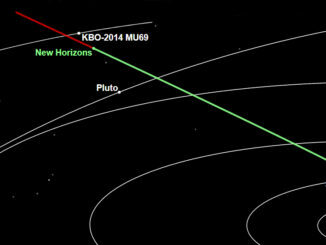 The competition is for the next mission in NASA’s New Frontiers program, a set of medium-cost planetary missions that has so far included the New Horizons probe that flew by Pluto in 2015, the Juno spacecraft now orbiting Jupiter and the OSIRIS-REx asteroid sample return mission that launched in September 2016. 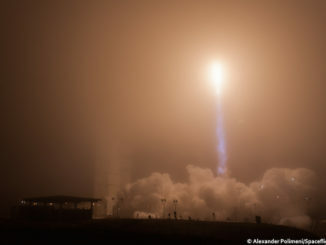 Senior NASA officials will select one mission from the New Frontiers proposals for full funding in mid-2019, with a launch targeted by the end of 2025. NASA has restricted the types of missions eligible for the next New Frontiers selection, including concepts to explore Enceladus and Titan. 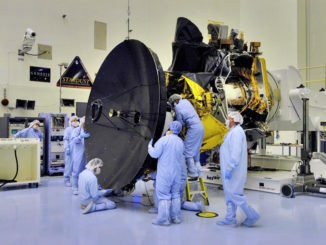 Other candidates are a comet surface sample return mission, a project to extract and return specimens from a basin near the lunar south pole, a mission to investigate the atmosphere of Saturn, a spacecraft to visit the Trojan asteroids sharing an orbit with Jupiter, and a probe to study the atmosphere and surface of Venus. Scientists believe Enceladus, with its constant eruptions, is an easier target to look for the existence of life. A mission with the right sensor package could fly through the plumes and search for materials like amino acids and other biosignatures thrown into space from Enceladus’s ocean. For Europa, with its supposed intermittent plumes and an ocean containing twice the water in all of Earth’s seas, looking for life is more tricky and may require a lander. “If we’ve got a salty ocean in contact with a rocky core and energy from a variety of sources … We have many of the ingredients thought to be necessary for life,” said Sparks. NASA has officially approved development of a sophisticated flyby craft named Europa Clipper to make dozens of close approaches with Jupiter’s icy moon at altitudes as low as 16 miles (25 kilometers). Europa Clipper is set for launch as soon as 2022 and could arrive in Jupiter’s neighborhood in the late 2020s. A team of scientists and engineers at the Jet Propulsion Laboratory is also designing a robot lander that could touch down on Europa in the early 2030s, assuming Congress funds the mission. 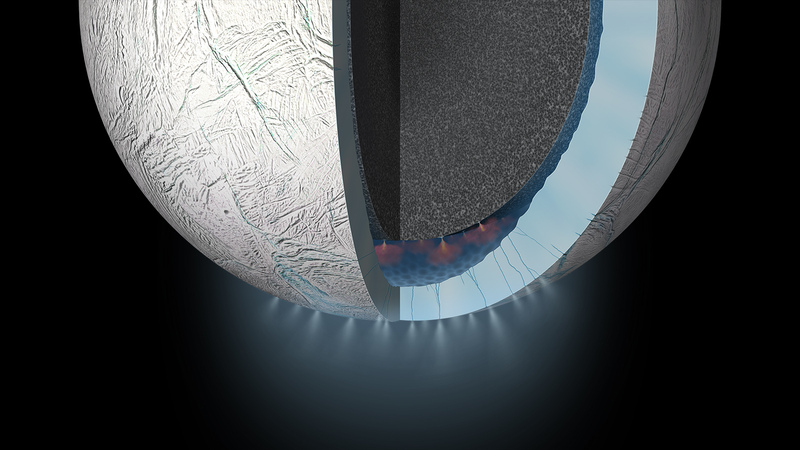 Voytek said Enceladus is thought to be younger than Europa, and the levels of hydrogen detected by Cassini mean a lot of energy is not being consumed by potential organisms living in the moon’s ocean, raising questions about whether microbes actually exist there. According to Voytek, Europa may be the better candidate for life if it has the same types of hydrothermal activity as Enceladus. “There’s no reason to think it wouldn’t be happening on Europa,” she said. “We know that Europa and the moons around Jupiter were formed 4 billion years ago,” Voytek said. “That’s a lot more time for life to have emerged and start taking advantage of these energy sources.